Colombo – USAID and IOM, the UN Migration Agency, this week handed over new transitional homes to 120 families affected by the May 2017 floods and landslides in the Rathnapura district of Sri Lanka. The homes, which were built by IOM in Dombagammana village over the past three months, will house some 445 people, including 194 children. The families either lost their homes to floods and landslides or were unable to return home due to the ongoing risk of landslides. 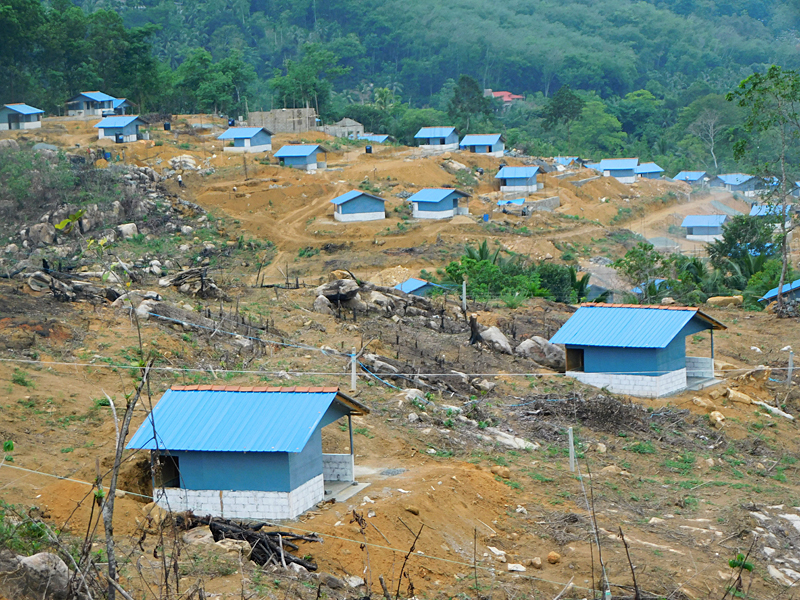 The new temporary homes were built by IOM on land permanently allocated by the government. Families will eventually be able to upgrade them to permanent housing on the same land, with government support. IOM also built a community hall and clean water supply infrastructure in the village as part of its USAID-funded Sri Lanka Adverse Southwest Monsoon Response Project. “I am delighted to have met these resilient families. The US Government is proud to contribute to their recovery process through our work with IOM and the Government of Sri Lanka,” said Reed Aeschliman, USAID Mission Director for Sri Lanka and Maldives. IOM’s USAID-funded monsoon response project was launched in June 2017 in response to heavy flooding, landslides and flash floods caused by the southwest monsoon, which affected some 684,000 people in southern and central Sri Lanka and left 224 people dead. Through the project, IOM built a total of 187 transitional shelters, and procured and distributed, in partnership with NGOs World Vision and Save the Children, 3,700 non-food item and 3,300 shelter kits (in kind and in cash) for nearly 21,500 people in the badly affected districts of Rathnapura, Galle, Matara, and Kalutara. The work was coordinated with the Shelter Sector group of aid agencies, which IOM co-led with IFRC, under the Emergency Response Plan launched by the UN in June 2017. Overall, more than 61,000 people from 13,000 families were provided with assistance through IOM’s emergency response to the flooding and landslides in the shelter, non-food items and health sectors, with funds from USAID, Canada and UN CERF. IOM also helped government and other humanitarian partners keep track of displacement and return rates through the deployment of its Displacement Tracking Matrix (DTM). IOM has also been supporting partners to better prepare for future disasters through providing Camp Coordination and Camp Management (CCCM) trainings and the identification of evacuation routes. “The government and communities urgently need to prepare for and build resilience to natural disasters and climate change due to the increased frequency of severe and unpredictable weather patterns in Sri Lanka,” said IOM Chief of Mission for Sri Lanka and the Maldives Giuseppe Crocetti. For more information please contact Giuseppe Crocetti at IOM Sri Lanka, Email: gcrocetti@iom.int, Tel: +94 115325300. The new homes will house 120 displaced families. Photo: IOM.